This review is about a blond band fall manufactured by Jacquelyn Wigs which is based in New York. 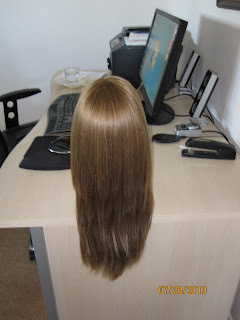 Based on their website, they manufacture everything from Custom European Wigs to Synthetics and they also make integration pieces (Toppers, clip on ponytails, hat falls). A lot of their styles pictured on the website look like they were photographed in the late 1980s or early 1990s, but they have added some newer styles as well. Also, I couldn't find any wigs on their site with multi-directional skin top, so I am curious to know if they make them. If you know anything about them please comment. I heard you had a terrible experience as a kallah before finding the wigs and falls you were happy with. Would you care to elaborate on this? I first bought a Yaffa on Ebay for my sheva brachot which was pretty but very tight on my head. I wound up selling it to someone else on Ebay about 2 months later and purchasing a Milano. That was a disaster for multiple reasons and I went a while without wearing any sheitel due to the trauma of it all. I finally decided to buy a Shevy last year and invest the obscene amount of money that I knew it was going to cost because only spending that much money would force me to wear a wig! I am so sorry to hear about your mishap. I actually also bought a Yaffa on Ebay and a Milano when I first got married!... I’ll elaborate on it later. I am glad that you finally feel comfortable and happy in the wigs you own now. Let’s talk about one of your headband falls. What made you decide to purchase a Jacquelyn? Where did you hear of the brand? It was purely by chance that I bought this fall. I happen to go into the store of a local Los Angeles sheitel macher last summer and saw that she was having a sale on long Jacquelyn falls and Galit Italia wigs. The color of this fall immediately caught my eye so I gravitated right to it. I tried on a full Galit Italia wig just for fun but I wasn’t in the market for a full wig at the time. What color is your Jacquelyn? Dark Blonde with blonde highlights-I had cut the tag out since it was itching so I don’t have an exact color number. No-the one problem I had with this fall was that the cap was too large. I had to take it in to be fitted smaller. 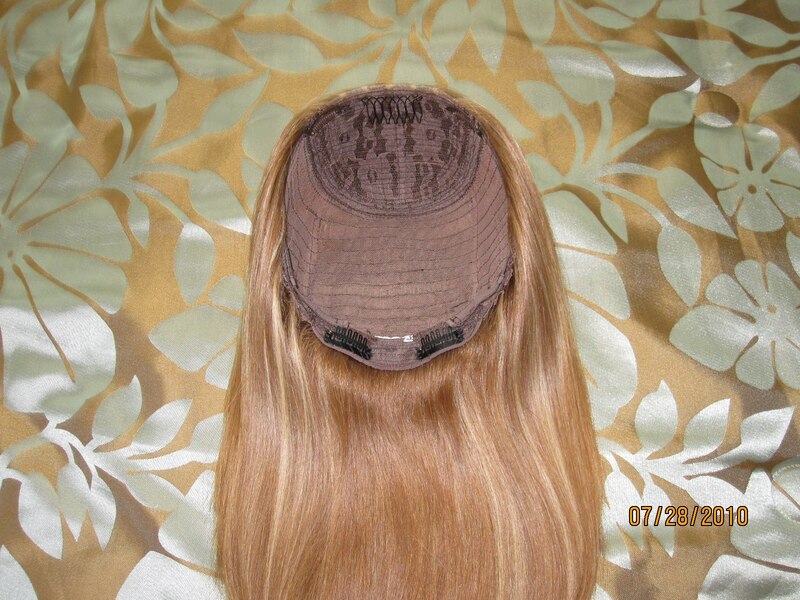 The sheitel macher sewed up a bit of material on the sides to make it conform better to my head. The cap is my least favorite part of the fall. Although it was sewn to be tighter, it isn’t great. Since it is a fall and not a full wig it doesn’t bother me to wear it. Were it a full wig it would have been more uncomfortable. Please describe the hair texture and quality. The hair is silky and straight. I am very happy with the hair quality and I receive many compliments on how my fall looks. I have even washed the fall myself a few times and let the hair air dry and had no problem with knotting while wet. I do prefer to have it professionally washed and styled though. Would you buy a Jacquelyn again? I think I would go with a Tori or an Elka for my next wig but I do like this fall. Since it was on sale, it was only $800. I love my fall’s highlight pattern. I had the fall cut elsewhere but am extremely happy with the cut. Thank you for the review. The hair looks lovely. Some resellers of Jacquelyn Wigs actually provide more information than they do themselves (when I mailed them once, they only wanted to give more information by telephone, which comes rather expensive since I'm outside of the US). 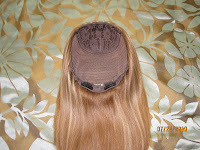 bestwigs.com -> you can filter on hand made tops and micro tops. The micro tops are single monotops as far as I know. 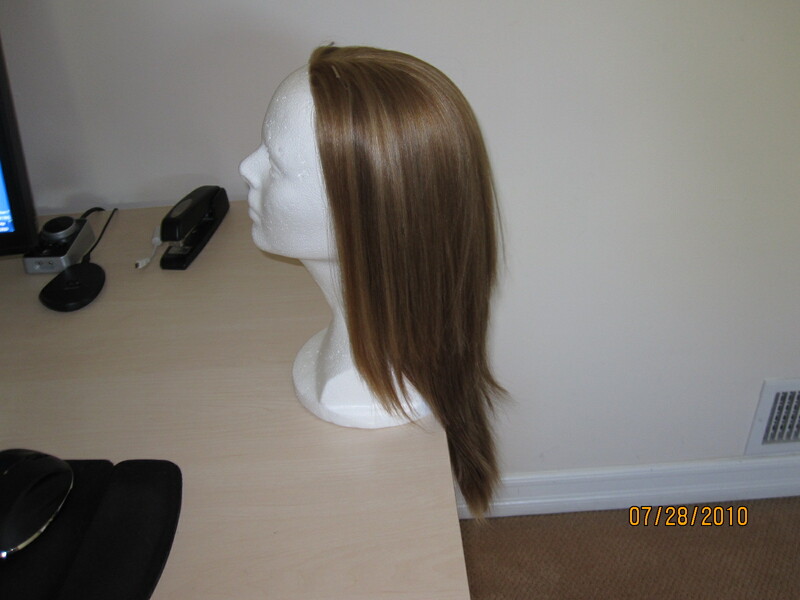 wigsupport.com has pics of an integrations piece's inside, you can request pics of other caps too. Mail Kathy Tonkins. Fortunately, the newer items of Jacquelyn are modern styles and not the '80s straight-from-Dallas do's.